Does the idea of skin care products based on snake and bee venom turn you on? Whatever your response might be, we think you should definitely take out the adventurous part of you and rebel out your skin care routine by beginning to use VENOFYE’S ViperLift & Orchard Bee products. ViperLift’s groundbreaking formulas were created to minimize the appearance of wrinkles and expression lines while revitalizing and adding luminosity to the skin while Orchard Bee is more intended to protect your skin from UV Rays and sun exposure, and at the same time give you glow, reduce the appearance of age spots and give you a more youthful appearance. I will try to give you my most honest review about two out of four products from VENOFYE’S ViperLift Collection and one product from a total of three from the Orchard Bee Serie: the ViperLift Bio Mask & ViperLift Bio Syringe, and to round it up, I’ll talk a little about Orchard’s Bee Brilliance Cream SPF 30. The packages are sophisticated and attractive, the boxes color on the ViperLift Collection are black with embossed snakeskin designs, and metallic logo and product information (such as product name, ounces and instructions etc.) The boxes look like presents and they open up by pulling out a magnetic end which makes it look and feel very high end and well thought of. The product bottles are slick and fashionable and look kind of futuristic with transparent plastic (easily mistaken for glass) containing another black container inside but all part of the same piece. The ViperLift Bio Mask has patterned lines on the inside container with a metallic lid. The ViperLift Bio Syringe doesn’t have patterned lines but it has a very neat (V) icon and it also has the actual shape of a syringe. In an almost contrary way the Orchard Bee Brilliance Cream SPF 30 has a light gray metallic inside container with patterned lines and is composed out of the same materials as the ViperLift Bio Mask product, by having the same clear plastic and metallic lids but have different bottle shapes. The box has a metallic light gray color with glossy transparent hive decorations and metallic logo. The packaging’s are appealing and delightful! When opening up the ViperLift Bio Mask box you will also find the simulated snakeskin texture finishes on the inside of the box and on the area where the product is placed at, the mask also includes a small spatula to apply the product and to distribute the cream throughout the skin. 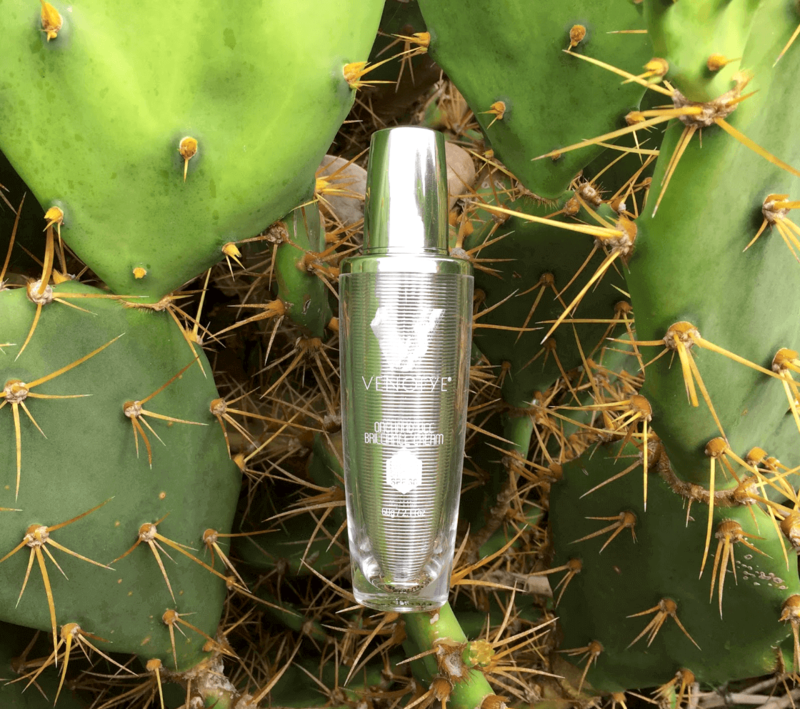 The bottle shape of the mask is like a small rounded little jar in comparison to other ViperLift products that might look more like a perfume, such as the ViperLift Bio Serum or like a Syringe which is the other product we’ll be commenting on this review. When opening up the lid of the ViperLift Bio Mask the product will be sealed with an aluminium cover, a detail that proofs that the product must be well conserved and protected. The aluminum seal has to be opened carefully since the cream has a very light volume and it is quite liquidy (you won’t want to spill a drop of your new rejuvenating potion), you could use the same spatula to carefully open up the foil. Once opened, you can see the color of the Bio Mask is sort of a creamy bone white or beige, the aroma of the ViperLift Bio Mask is similar to the one found on professional dermatologic products but with floral hints. When applying the product, it feels good, it has a warm sensation but it doesn’t burn, so it doesn’t feel like it’s is causing any type of harm to your skin. We could infer that the warm sensation might have something to do with the snake venom, I have never been bitten by a venomous snake but I can imagine that it should burn, and hurt, and could make you feel sick? But the snake venom properties used on the Bio Mask don’t make you feel any of that. 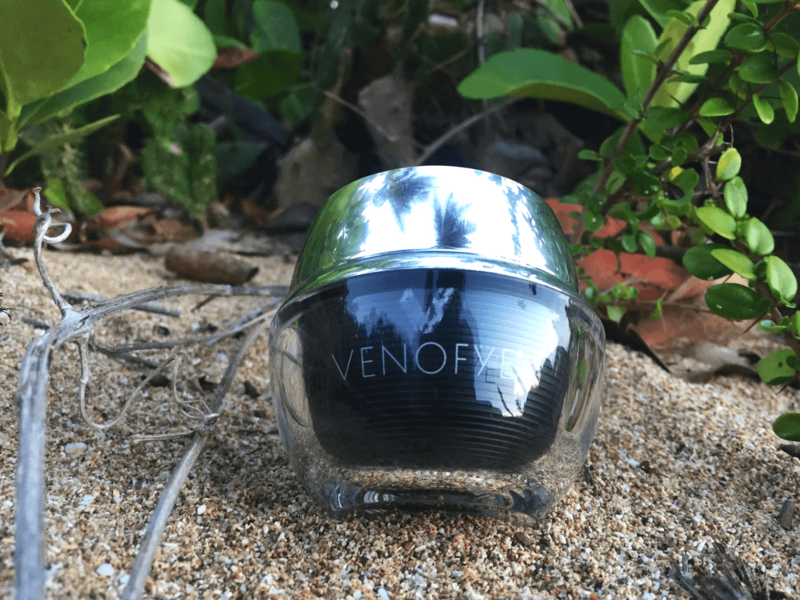 Venofye just took out the best qualities out of the venom, the ones that make your skin rejuvenate and look younger. The instructions that appear in the product box say we should leave the mask for about 10 to 15 minutes while massaging areas of the face where there are wrinkles and/or dark spots. Around 5 minutes after adding the product you can already start feeling how your face feels kinda stiff and thither, the product slowly dries out and then you just have to cleanse it out with water, the product comes out pretty easily and your skin feels soothed and refreshed. The ViperLift Bio Mask is intended to be used once per week for a month and then only once per month. The ViperLift Bio Syringe is very unique! When opening up the case the syringe is placed on a black velvet holder and the product is literally shaped like a real life syringe with a transparent barrel, black plunger, metallic logo and name product. The syringe comes doubled capped with a transparent cap that clicks on to the barrel and a white rubber cap that sticks to the head of the syringe preventing the product to spill out. 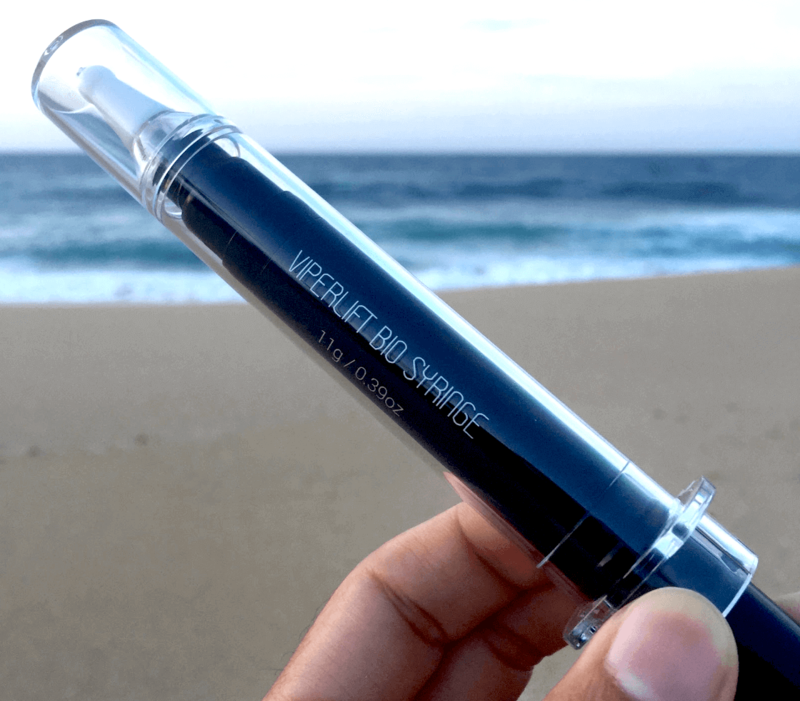 When getting ready to apply the ViperLift Bio Syringe make sure your face is clean, unlock the barrel and gently press the top of the syringe down applying directly to affected areas, remove excess product with a cotton swab if necessary. The product is also quite watery and has a neat peach coral color to it, after a brief time of applying the product you can feel your skin get tighter while the cream dries up in your skin. You won’t believe the effects of the syringe when you wake up the next morning, the skin feels rejuvenated, smooth and steady. Wrinkles kinda want to start disappearing and the result is quite promising. I’ve been using The ViperLift Bio Syringe before going to bed for about a week now and my skin feels a lot tighter and with less marks and wrinkles. I tend to become a little bit obsessive about getting under-eyes circles when I don’t get a good night sleep and think about it all day, this week I have gotten good and bad sleeps but I haven’t been thinking about my eye shadows after those not so good nights because I can’t even see them. After using this ViperLift Duo you’ll feel brand new, like a snake when it sheds the skin for a new one. As I was saying, my young home garden already has a decent amount variety of flowers, some that were naturally there and others I have brought. There’s a particular bush that attracts a rare type of butterfly that is in danger of extinction, this knowledge was brought up to me by a specialist electrician that helped me out with fixing the power energy of my house after hurricane Maria striked Puerto Rico. He had told me that his best friend is a specialist in butterflies and that they frequently go for climbs and hikes, and in various occasions he’s friend had showed him the tree and explained to him the story about the tree and the butterflies it attracts. Once he saw the small tree he got quite excited and told me I should never get rid of it. Hurricane María destroyed everything in its ferocious pass, a hundred percent of the power energy of the island collapsed, mountains looked as if a giant with a great trimmer cropped the trees and some houses and roads were demolished to shreds but still this small tree, the one that attracts the endangered butterflies was intact and started flourishing just a couple of days after the hurricane. In order to protect my skin from UV rays and not affect the process of the ViperLift treatments while working on the garden, I thought it would be proper to use a product that would protect my skin from the sun while at the same time add other benefits to it, this was the main reason I went on to use the Orchard Bee Brilliance Cream SPF 30. The aroma of the Orchard Bee Brilliance Cream SPF 30 is very similar to a sunscreen, with a liquidy condensation and a whitish look. With just one small drop of cream you can cover a wide range of your skin. The cream contains an developed illuminating properties that protects the skin from the sun’s damaging rays while it helps stimulate, brighten and diminish the appearance of fine lines and dark spots. Bee Venom is one of the main ingredients of the Orchard Bee Brilliance Cream SPF 30 and on Venofye’s main website says that it is popularly known that Bee Venom works in a similar way as a botox does, the skin reacts as if it’s been stung, thereby it brings out a plumping and tightening sensation. I was pretty comfortable with the cream, it protected my skin descently from the sun and hopefully the bee venom was doing it’s work while I myself labored on my small piece of eden. As the sun set down, I picked up my tools and storage them, I took a nice refreshing shower and continued to my routine with the VeperLift Bio Syringe to continue my new skin care cycle. So far, this skin care power trio has gone beyond my expectations. 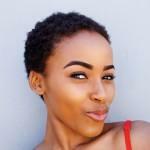 My dark circles have been considerably reduced and the skin feels and looks rejuvenated and more healthy. Venofye have proven to produce professional and relevant products while achieving an elegantly and stylish brand throughout its package designs and overall look of products. Can you use vebofye viper lift bio syring under or over makeup? ? Can someone please advise? Everything i read says to apply to clean skin at night…nothing tells me if I can use it in the morning before putting on moisturizer and makeup….if it lasts 6 or so hours it really doesn’t matter if I’m sleeping…I bought the Venofye Syringe so could you provide some additional information? Yes, you can use the Viperlift Bio Syringe during the day, that’s no problem! Venofye advises against applying makeup directly over areas where the syringe has been applied.